Shadowrun: Crossfire Prime Runner Edition tweaks the rules, adds more missions, and makes other updates to the popular Shadowrun: Crossfire cooperative deck-building game. To make sure all players can join in the fun together, the Prime Runner Refit Kit contains just the changed items, so that those who already own the game can buy only the items they need to get on the same footing as other players. Includes the rulebook from the Prime Runner Edition so that players can quickly learn the changes. Adds two new missions. Includes changed cards resulting from different rules tweaks that players can quickly integrate into their games. 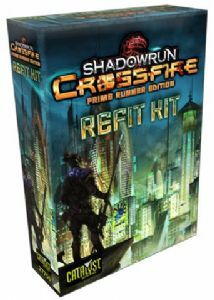 This Prime Runner Edition of the Shadowrun: Crossfire Deckbuilding Gamefeatures updated and revised rules, redesigned character cards, and new missions designed to streamline the game and make it more accessible.